On the surface, building a custom and building a race bike are pretty similar endeavors. 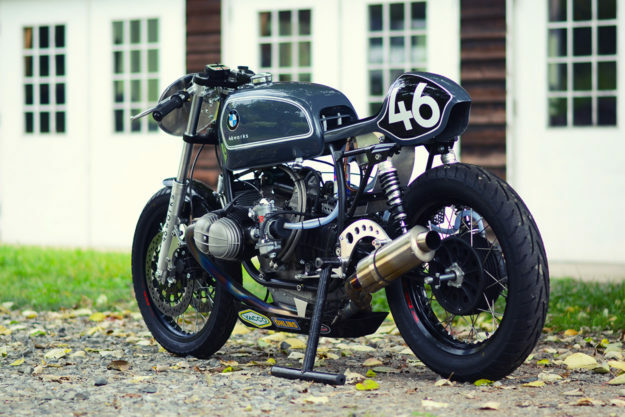 And there are quite a few builders with track records: in the US, there’s Roland Sands, Michael Woollaway of Deus, and Richard Pollock of Mule Motorcycles. Their road going bikes differ in style, but all have one thing in common: the immaculate construction and detailing you’d expect to see on a track machine. In Japan, the best-known equivalent is Shiro Nakajima of 46Works. 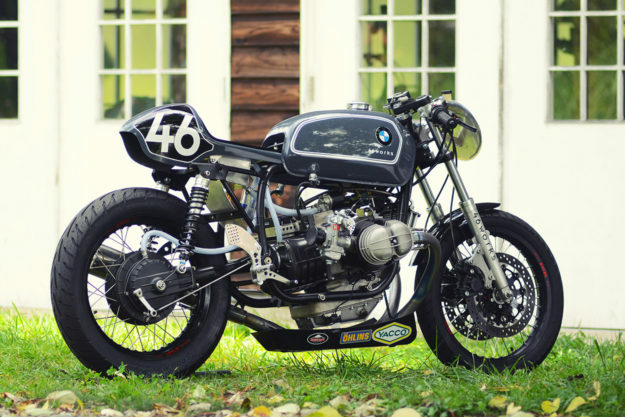 When he’s not building vintage cafe racers for his clients, he’s out on the track. 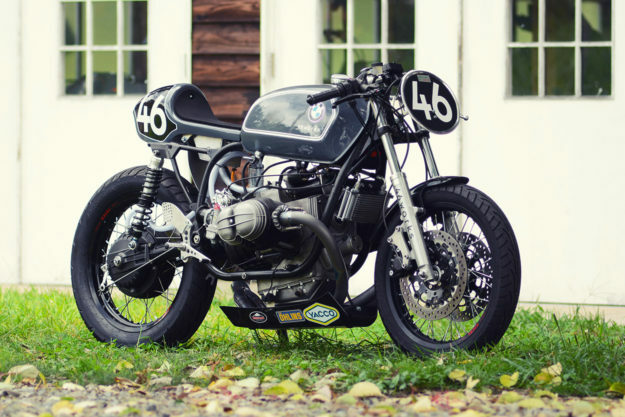 Nakajima-san is a fan of vintage racing, and competes in a series called ‘Legend Of Classic.’ It’s held four times a year at the Tsukuba and Fuji Speedway circuits, and lately he’s been campaigning this stunning 1970 BMW R75/5. Nakajima doesn’t just ride fast: he works fast too. 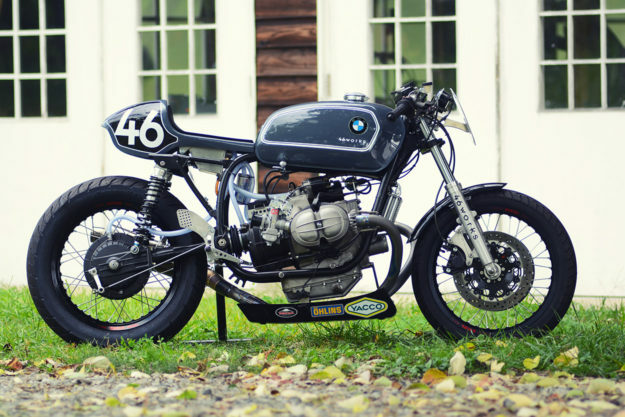 Despite the amazing detailing, it took him just three weeks to build this BMW. And that includes the substantial mods and bracing for the frame. 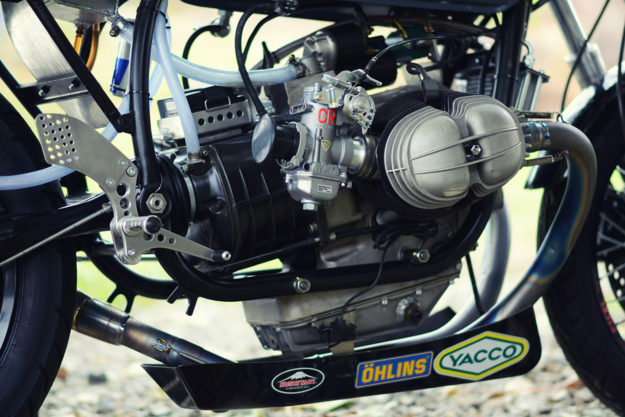 As with any race bike, the story starts with the engine. The boxer twin was stripped down, blueprinted, and rebuilt with a tasty selection of hot rod parts—notably Carillo con rods and high compression pistons. Capacity gets a boost from 745 to a whopping 979 cc, and there’s a hotter cam to improve breathing at high rpms. Big valves (with titanium valve spring retainers) allow the fuel and air to get in and out faster, helped by a port and polish job and 39mm Keihin CR Special carbs. Nakajima is also a dab hand at pipe bending, so he created the titanium exhaust pipework and the muffler himself. The result is 85 horsepower at the back wheel—a big jump from the 50 horses at the crank of a stock engine. On the suspension front, Nakajima’s secret weapon is Yamaha 35-millimeter forks. 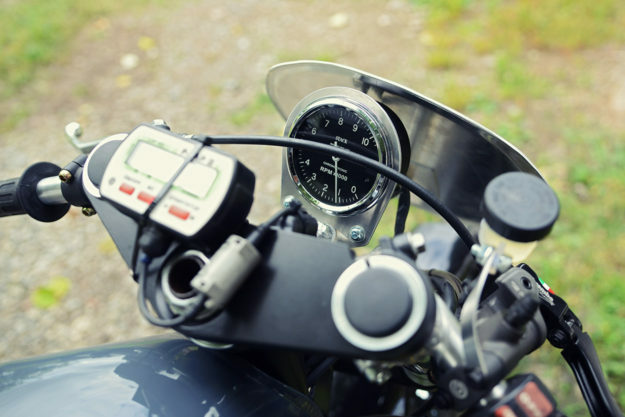 He won’t say what exactly they are, but he’s used them before—notably on his last Moto Guzzi racer. They’re matched to classic Öhlins monotube shocks at the back, with progressive rate springs. The Excel rims are shod with bias ply Dunlop Arrowmax GT601 tires. A toaster tank would be too big for a racer, so Nakajima has chosen one of BMW’s sleeker designs, used on the US versions of the R50/5 and R90/6. The blue-grey paint and white pinstripes add an air of elegance that you don’t often see on a race bike. 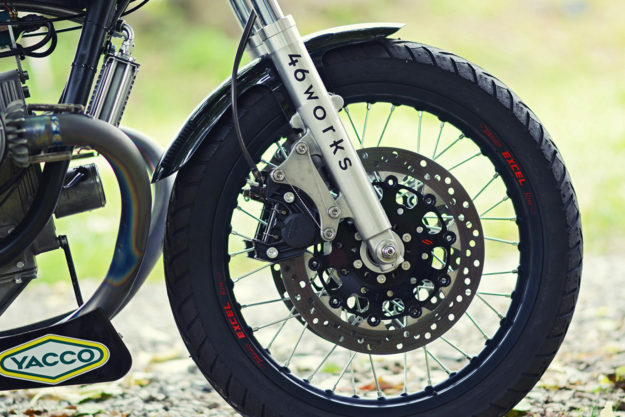 The unusual tailpiece styling is Nakajima’s signature, developing over the years as he gradually incorporated number boards into the tail sections of his bikes. 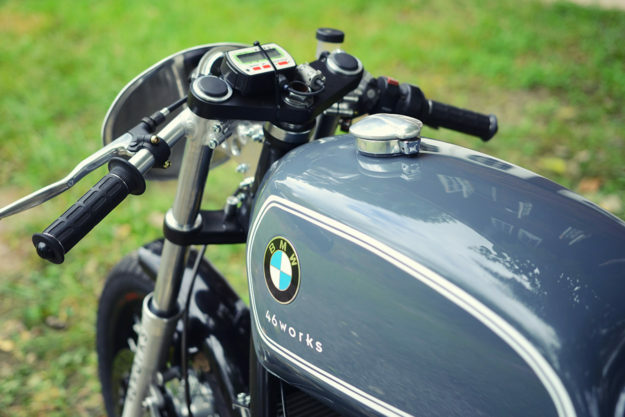 We first saw hints of it in the BMW R100 race replica he built while at Ritmo Sereno—before the design was refined for his ‘official’ BMW Japan R nineT build and his recent custom KTM RC8. It’s one of many thoughtful pieces of fabrication on the R75/5. 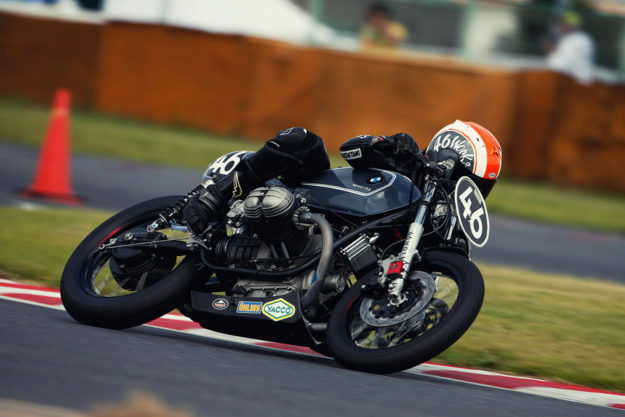 Nakajima completed the BMW the day before his first race, and he’s now won the Legend Of Classic championship. Not surprisingly, the order book at 46Works is healthy: In Japan, the old adage ‘Win on Sunday, Sell on Monday’ still holds true.